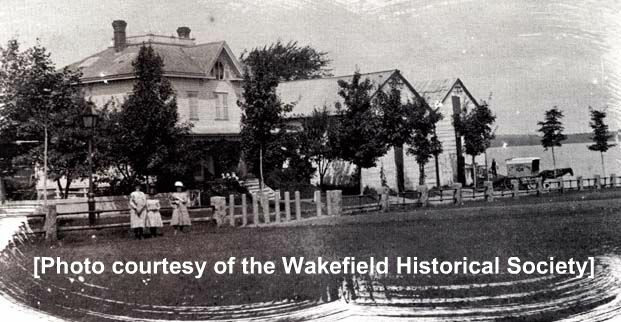 "This circa late-1800s photograph depicts a bygone era and a look at the area around Wakefield Common as it once was. The photo was taken on the lower Common, looking out at Lake Avenue, near Spaulding Street. According to Town records, Mrs. J.H. Cartland was listed as the owner of the two-family home at 3-5 Lake Avenue in 1876. The ice houses at the right of the photo were probably part of John G. Morrill's Ice Company which was located on Spaulding Street. Although J.H. Cartland was reported to have sold brushes from a location on Church Street, he was also an ice dealer, delivering ice to homes throughout Wakefield. In 1887, the property was owned by Will Wiley who, with his father, Albert Wiley, had operated a boat house on Spaulding Street, beginning in 1872. A new boat house was built on Lake Avenue in 1887, with a dance hall added in 1912. The boat house and the adjacent home were sold to Harold and Gertrude Hill in 1923. Mrs. Hill sold the property to the Town of Wakefield after Town Meeting voted to purchase the boat house/ballroom, garage, house, and 17,850 sq. feet of land for $55,000 in October, 1963. A committee was created to determine a use for the property in March, 1964, and voted to demolish all the structures. A Town Meeting vote in June, 1964, appropriated $9,500 to raze the buildings. Demolition took place in September, 1964. Several uses for the property, including a youth/senior center, were discussed over the years. Today the site is occupied by a playground created for the Town by the Wakefield Center Neighborhood Association." -- Text from calendar by Jayne M. D'Onofrio. “Cartland house and icehouses, Lake Avenue, (undated),” NOBLE Digital Heritage, accessed April 20, 2019, https://digitalheritage.noblenet.org/noble/items/show/6892.